US embass­y says protes­ts are damagi­ng Pakist­ani and Afghan busine­ss intere­sts. 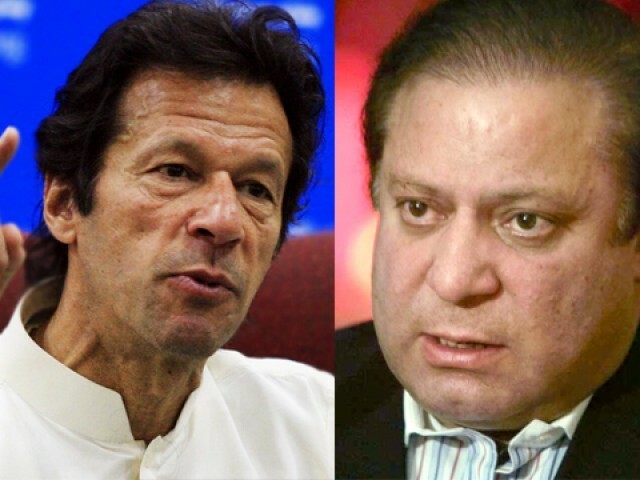 With Pakistan Tehreek-i-Insaf (PTI)-led anti-drone protests reaching the federal capital on Thursday, Prime Minister Nawaz Sharif issued directions to the interior minister to end the anti-drone campaign that started from Khyber Pukhtunkhwa (K-P) after a drone targeted the Hangu district. The officials further quoted the premier as saying that if Imran did not pay heed to this request, then the governor, chief secretary and inspector general of police in K-P should be directed to look into the matter and chalk out a strategy to end the unproductive protests as they are embroiling other parts of the country including the capital and heightening security threats. Officials said that Nisar had assured the premier that the chief secretary and IG police are civil servants and will follow the instructions that have been issued by the centre. As the premier called for an end to PTI’s protests, the North Atlantic Treaty Organisation (Nato) expressed its resolve to continue the uninterrupted supply of cargo to allied forces in Afghanistan, while Pakistan’s Foreign Office pledged its assistance in the drawdown of Nato forces despite the temporary blockade of the supply route at Torkham border. “We will use all supply routes available and will use all available means – including air and ground – ensure supplies and equipment continue to move,” a Nato wrote in an exclusive email response to The Express Tribune. Official John Ripley commented on behalf of the Atlantic Alliance, saying, “While travel via Pakistan is favoured because of convenience, we have flexibility and redundancy for all means of transportation.” Nato’s headquarters did not, however, respond to several other queries relating to financial losses or shortage of goods, and referred the matter to the US Embassy in Islamabad. An embassy spokesperson on Thursday said that while the US and Nato have alternative routes for shipping supplies to and from Afghanistan, the demonstrations are having an adverse impact on local commercial trade, which comprises the overwhelming majority of the supply route’s traffic. “As a result, both Pakistani and Afghan business interests are suffering, as are the people who depend on products, including perishables that are shipped via this route,” the official said. At his weekly news briefing, Foreign Office spokesperson Aizaz Ahmed Chaudhry told reporters that the federal government continues to facilitate arrangements for the passage of Nato supplies to ensure the safe exit of foreign forces from Afghanistan. The spokesperson emphasised that the government has consistently called for an end to the CIA-led drone campaign in the tribal areas. “The government has taken up this matter at the highest level with the United States and has also taken it up at United Nations. The government believes that all aspects related to these issues need to be settled peacefully and through talks,” he added. The US military on Wednesday announced that it was ‘voluntarily halting’ shipments leaving Afghanistan via Pakistan due to security of drivers. However, the State Department said the US favours using Pakistan overland routes for the retrograde movement of equipment out of Afghanistan and voiced the hope that the current situation in Khyber Pakhtunkhwa with regarding to the Torkham route would not have a long-lasting impact. Published in The Express Tribune, December 6th, 2013. Imran Khan also met with some diplomats from European countries to brief them over the blockade. Former minister claims NATO supplies are being carried out using Afghan transit containers. MQM circulates list of JI activists associated with militant groups. Nawaz Sharif is spot on to state that this blockage is totally un-productive and un-called for and if I write something more, the ET moderators would axe the same. Protest is proving productive for people of Pakistan as Pentagon refused to carry backlog through Pakistan. All ambassadors of Nato assured that they will put pressure on USA , issue is highlighted this time across the world but according to PM this is not productive. Actually he made promised with his lords (USA, IMF) and this protest is restricting him to serve the master that is why he is of the view that this is counter productive. Question to PM: And whats your productive step to save the innocent people of Pakistan? Yes because my wealth is abroad & in Danger. PTI knows only to agitate, not govern. Full support for PML-N to teach PTI a few basics about politics. Any more wishes PM ? Time to Stand with IK the great! I wish Mr. Sharif would also outline his PLAN to stop the drones. Remember he was all for stopping drones BEFORE the elections! Height of hypocrisy! Nawaz Sharif acts like a Mughal Emperor. Is that your definition of real politics? Wait a second… i thought drones were counterproductive… now protest is counterproductive. So we have a counter-counterproductive situation which should prove very productive! And what productive steps have Nawaz Sharif taken to stop these drone attacks? Unnamed “Officials from the Prime Minister House” – not the Prime Minister. Stop making things up ET. Stop your drone attacks, then the supply route will open as usual. I am surprised the US, after almost 12 years of using and abusing Pakistan, cannot even make one compromise. This arrogance will cost them. Pakistan should have never agreed to enter this war in the first place and remained neutral. Well said! While IK is leading the peoples resistance against hegemonic control of the USA, the Prime Minister is graduly being pushed into the becoming the ceremonial Prime Minister of the divided country. Well said! While IK is leading the peoples resistance against hegemonic control of the USA, the Prime Minister is gradualy being pushed into the becoming the ceremonial Prime Minister of the divided country. Solution: PML should announce it will not tolerate any drone and will shoot any foreign aircraft, be it US, India, or any other country. Shoot down one drone, and send that drone back to USA. All drone attacks will cease. Likewise, the Pakistan army can arm local Tribal people with anti-aircraft weaponry to prevent future attacks. Regardless, Pakistan should declare itself neutral in the war against Afghanistan and not allow itself to be used by foreign powers. It’s a matter of principle. This is end all of Pakistan’s internal security issues, as well as increase its power and influence in Afghanistan and Kashmir. Wasn’t a PTI fan to be frank, but IK has proved his mettle as a national leader. But I doubt his family would become terrorists, as the excuse naively portrayed by Imran Khan. NS assigned the task to Chaudhry Nisar! This sure will happen now. Sharif is missing the point. Nothing wrong with protesting drones or anything else – but that doesn’t give you the right to stop traffic, harass drivers or otherwise take control of the border. Sharif should do his job – provide protection to drivers and toss those who are breaking the law in jail. Taliban Khan’s boycott won’t stop drones but it does make Sharif look weak and Pakistan look duplicitous. Yeah sure like they’d love to let the terrorists like who kill their soldiers in Afghanistan. Or maybe they think Pakistan and IK are perfect leaders to build a strategic alliance with by ditching USA? PTI troll’s rhetoric is growing increasingly bizarre and comic each passing day. Same as their leaders. Please choose an opposite username, this one doesn’t go by your comment. now that US stopped using their roads, the beggars are feeling the pinch of lack of funds flow….no wonder they are rebuking their own kind…!!!!!!!!!!!!!!!!! What economic problem? Dar can print another zillion billion rupees and just give it to the truckers! Is’nt that how the country is paying its bills at the moment? A billion here and billion there, what does it matter? Good IK keep it up. Lets see how long the $3Bn foreign exchange lasts. People can write as many insulting articles as they want. The bottom line is that as the PM has stated in so many words, Pakistan has an economic problem. In other words outlay is greater than income, and IK cannot be blamed for that, although that is obviously what he is attempting to do. Also of course it is a US political ploy to discredit IK. Pakistan is not alone in spending more than it has got. One only has to look at the US and Europe to see that many countries have an economic disaster on their hands, either now or impending in the near future. The PM should talk to some of the 90 million or so women in Pakistan who have to keep their households going on a limited budget. It really is quite simple to balance a budget. Every family in the land has to do it. If they do not the results can be very tragic. There is still time PM, but it is running short for Pakistan, and you cannot rely on the US or International banking systems forever. Balance the budget now, and make any adjustments accordingly. If you do not it will be far worse later on. @S: And who are these innocent people? Foreign nationals using Pak territory to plan terrorist attacks, and killing and maiming Pak security forces and citizens in markets. For God sake, have some common sense. Let them go somewhere and fight their fight. They can take Imran Khan as well with them. Some of the people IK misjudged only after damage done i.e Ziaulhaq ,Jamaima, fazlurehman, ,Parvez Musharaff,political lotas.Some of the situations he missanticipated and earned embarassment.i.e Trial of Altaf Hussain, clean people, Tsunami,clean sweep..26 years gone!